This trendy studio apartment will be equipped with all the essential features required for contemporary living, including an instant boiling water tap, a warming drawer in the kitchen, and underfloor heating throughout. The kitchen will be complete with Siemens A-rated integrated appliances — set to include a fridge/freezer and an oven — and will boast Leicht soft close wall and base units. The bathroom will be decorated with contemporary finishes, including brassware with chrome mixer taps by VADO, and stylish porcelain wall tiling. 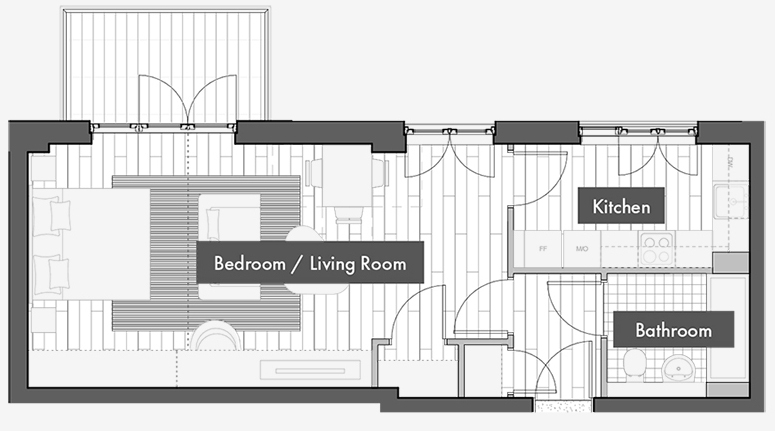 Meanwhile, residents will have access to the private balcony via the bedroom and living area.